Welcome the return of spring with a gathering of friendly, local gardeners. We will swap seeds, share plans, talk techniques, and even get some seeds started that afternoon. Growing from seed provides an opportunity to try a wider-selection of varieties at a fraction of the cost of buying plants. Most seed packets contain many more seeds than can be used in an individual’s garden, so instead of tucking those extra seeds to be lost in some dark corner of oblivion, come mix, match, and share them with a community of like-minded plant lovers. This can increase the range of flavors and the biodiversity of your garden. If you have never tried growing from seeds before, this is a great time to give it a try. 4-inch planting containers and potting soil will be on-hand. You can also lay claim to free native trees which will be distributed in late March or early April. So come celebrate the spring equinox by getting your hands in the dirt and enjoying some garden-nerd together time. Bring your seeds to share and potting soil if you have them. Kids are welcome. Contact merikays@verizon.net for address. Each year Merikay leads a project to distribute native tree seedlings in the community. 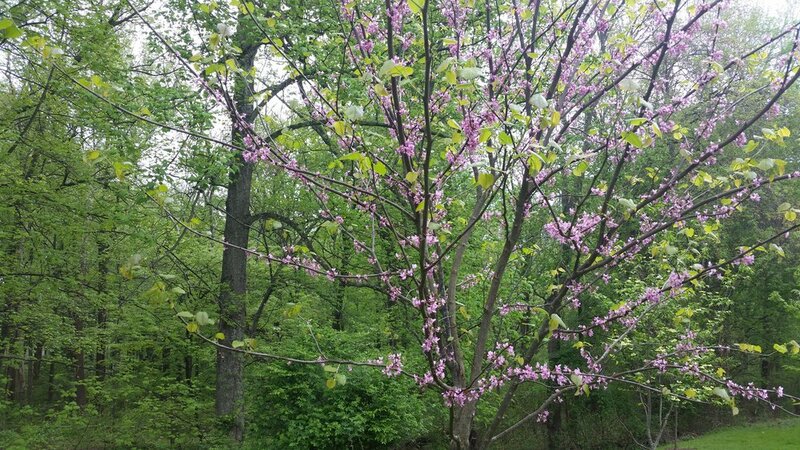 We have 350 native trees to give away -- up to 10 trees per household with a preference for residents living in the Muddy Branch or Seneca Creek watersheds. Trees will be available sometime in late March, with the exact date determined by the weather. If you want to be informed when the trees are available, email merikays@verizon.net. Since trees are bare root, they must be planted as soon as possible after being picked up. We generally receive 50 each of seven different tree species. These are the trees requested for this spring: 50 buttonbush, 50 baldcypress, 50 river birch, 50 loblolly pine, 50 gray dogwood, 50 serviceberry, 50 white oak. This year Bonnie Bell will help by distributing some of the tree seedlings from Seneca State Park for those who live closer to that location than to Merikay's home at 14909 Spring Meadows Drive, Darnestown. This is the 5th year Merikay Smith has led the native tree give away. In that time approximately 1,700 native trees have been planted through this program in our watershed area, providing habitat, cleaner water and reduced flooding. Celebrate the completion of our Pleasant View project as we prepare the native plant garden for spring. We welcome past volunteers as well as new to be part of this significant project. Learn simple ways you can make your own property more habitat friendly. Photos below from Earth Day 2018 — guess who is the Nobel Prize Winner for Physics and Gaithersburg City Councilmember — and imagine the future for our younger volunteers. One thing you’ll find at Pleasant View, we all work hard, happily and well together regardless of prior gardening experience. If you want to remember what things were like when we started our project on Earth Day 2017, check out this: https://caitlinmariephotography.pixieset.com/earthdayevent/ or learn more about the entire project under “Pleasant View” on our main menu. Event on May 4 will have volunteers from Kentlands Ward and Montgomery Branch of The Church of Jesus Christ of Latter-day Saints. Please bring gloves and shovels. Project is for adults and youth 11+. Join us as we complete the native redbud tree planting project which we started last spring in honor of our former Stake President and beloved friend, James Baird. We will weed, mulch, pull invasive plants nearby, and install native plants like ferns, Virginia bluebells, etc. to help fill the space under our young trees. As these plants fill in it should help keep out the invasive plants. Anyone who attends church at the Stake Center is encouraged to help watch over our new little garden by weeding and watering throughout the season. If you have native plants in your home garden you are willing to donate, please contact Merikay. This project will be held in conjunction with Kensington and Rockville wards as part of their joint service day. Photos from May 2018 at the James Baird planting event. Interfaith Partners of the Chesapeake is hosting an interfaith walk and we’re invited. Jeff and I attended this walk last year along the Muddy Branch Trail and enjoyed meeting people of other faiths while hearing scriptures from various faiths. I was fortunate enough to spot an albino robin — quite a visual treat. If you can’t join this walk, please be sure to get outside with friends or family along one of our local trails to enjoy the wonder of spring. Learn simple ways you can help reduce flooding and improve local water quality. Merikay Smith, long-time Master Gardener and Project Leader for the Pleasant View conservation landscape project, has created a presentation on practical ways you can make a difference. We’ll also get to hear from a local Girl Scout troop about their cleanup of a park along the Muddy Branch. This presentation is free and open to the public — but we especially welcome current or prospective members of Earth Stewardship East to attend. This is the last of three free talks provided as educational outreach for our Pleasant View project funded by the Chesapeake Bay Trust through the Montgomery County Water Protection Fund. Event co-sponsored by the Muddy Branch Alliance. Photos above from Merikay’s garden. Growing a variety of host plants brings butterflies and birds to gardens. What do you “grow” in your garden with your plants? Muddy Branch Alliance is hosting a free workshop on gardening with native plants to create habitat and improve water quality. This is going to be a fun, practical workshop with a presentation by Lauren Hubbard, PhD biologist with garden design experience followed by one-on-one Q/A time where we will have knowledgeable people available to work with you on your specific gardening questions and design issues. The event is free but requires advanced registration so we can have a satellite view of your property to use in the personalized design Q/A time. We’ll also have info available on county and city rebate programs to help offset the costs of conservation landscaping. Sign up ASAP as slots are limited. This workshop is one initiative of the Lands Green Waters Clean program (supervised by Board member Merikay). Event will be live-streamed online. Details to come. 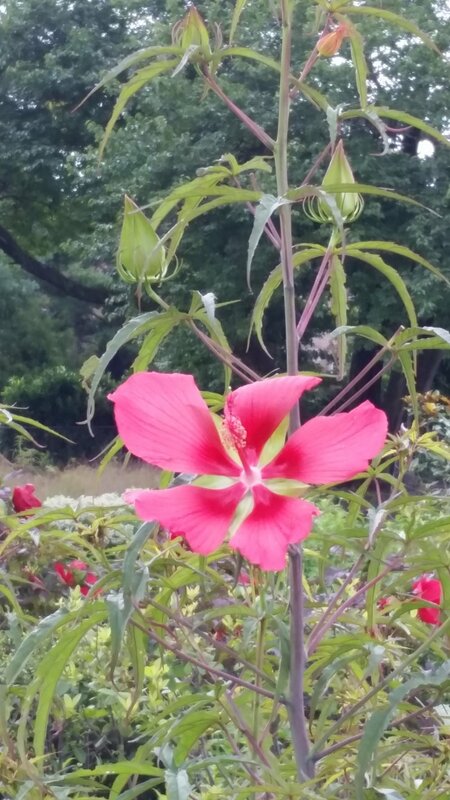 Our Pleasant View garden is being featured in a free tour of multiple Gaithersburg gardens sponsored by the Muddy Branch Alliance. Come visit any or all gardens at your own pace. Maps and info on conservation landscaping will be available at Constitution Gardens or online at www.muddybranchalliance.org. Gardens include the Constitution Garden Park, Woodland Hills HOA garden, Epworth Methodist Church, Pleasant View, and a private home. All gardens are relatively new landscaping and the tour should give you a chance to see ideas for plants that might work in your garden. Children welcome (Constitution Garden has lots of great play areas). 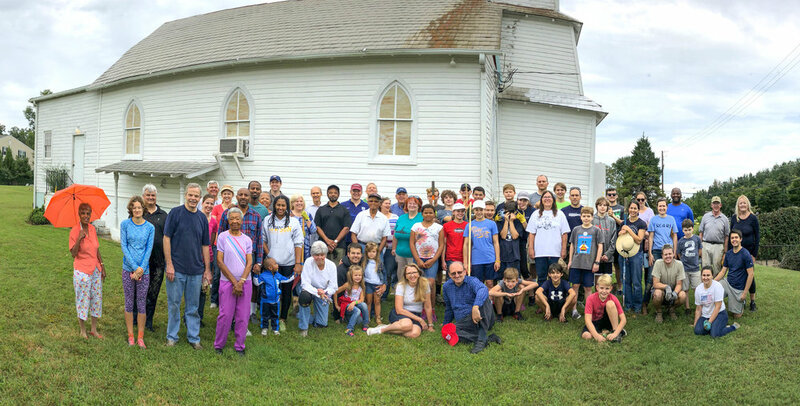 More than 80 members of the Potomac/Bethesda Wards of The Church of Jesus Christ of Latter-day Saints and others pulled weeds, planted trees and mulched our garden. Tilting headstones in the cemetery were straightened — a bonus. Lots of food and friendly conversation made for a fun morning. For details see "Pleasant View" from our home page. Katie led a group of hikers to “pick pawpaws and put ‘em in a pocket”. Despite hurricane forecast it was a sunny morning and lovely. We weeded the garden at Pleasant View on July 21, Saturday morning at 9 am. We'll repeat this coming Saturday, July 28. Pope Farm is donating 100 additional native plants to us which we will be installing. Thanks to our rain and relatively cool weather the plants should be able to survive being planted now. Special thanks to Dara Ballow-Giffen for getting the plants for us. Join us Saturday morning if you can -- this will be a small group event especially for students needing SSL hours and their parents but anyone is welcome. Celebrate 150 years at Pleasant View with gospel music by the Royal Harmonizers and the Seneca Gospel Choir, talks on local history, BBQ, and more. Visit with Pearl Green who just turned 100 and hear from her and others about attending school during segregation. We'll have a table set up under a tent near the garden to share info on native plants and conservation landscaping. Families welcome. Our gardens look great. Would look even better if the deer ate less! If you come on Saturday, plan to spend a few minutes pulling weeds and wandering in the garden. Hope you can come as this is going to be a memorable experience, not to be missed. Yucca filamentosa that we planted last year is now in bloom. This plant was often used in black cemeteries to mark grave sites. There are yucca growing in the Pleasant View cemetery -- also in bloom this week. About 30 of us met at the Washington DC Stake Center, 10000 Stoneybrook Drive, Kensington, MD to plant a dozen redbud trees in remembrance of James Baird, our former DC Stake President who passed away unexpectedly this past February. We had to work fast to get the area cleared of invasive plants and our trees in the ground and mulched before an extreme storm hit. The rain started as we drove from the parking lot. Thank you to all who came - and to those who wanted to be there but couldn't because of the last minute time change. James had a great love of the outdoors and of trees in particular. He also kept a collection of soil in carefully labeled bottles to remind him of significant places he had been in his life. It seems very appropriate to plant beautiful spring-blooming trees at the Stake Center where he spent much time. In fact, we learned the area where we planted is a trail which James helped create and used for the young men to have a woodland spot to gather around a fire pit and share ideas. Though he was our Stake President a relatively short period he had a tremendous impact on literally thousands in our community and he is missed. "I love this earth. I like to work in the dirt. I love to watch the sunset on warm beaches. I love the taste of a fresh toasted tomato sandwich with mayo, sea salt, and fresh-ground pepper. I love to stand in cold streams and try to outsmart the fish who have a brain the size of a pea. I love all of the physical sensations that my physical body experiences, like the way my stomach feels when you go over a rise too fast in a car. I love so much of what comes into my ears, my mouth, my nose, on my skin. I have spent much of my life pursuing these pleasures, and trying to provide them for others. I justify all this by reading in Genesis that God created all this for the use and benefit of man, to gladden his eye and lighten his heart. Certainly He wants us to appreciate His beautiful creations. While not a complete epicurean, I am well aware of how much I love all that God has placed for me on this earth, and have trouble imagining that it is any better up there. Maybe there are a few of you who feel this way too. Then why should we work to get off this planet that God placed us on and created for our use and happiness? How can we enjoy all this beauty and still try to follow our bishop’s council to try to rise above it all?" Indeed, that is our challenge: to enjoy our time on earth while making life choices that prepare us for our journey back to God. Check out the photos from the beginning of our project including these by Caitlin Moulton from April 22, Earth Day of last year: https://caitlinmariephotography.pixieset.com/earthdayevent/ Last year we had 100 volunteers on Earth Day. Invite your friends and neighbors -- this time we are not starting with bare ground and hopefully it will not be raining! We will have an educational team led by a Master Gardener who will walk the garden and answer questions about the plants for those who want to learn more with a special emphasis on helping people learn about native plants which might thrive in their own home gardens. 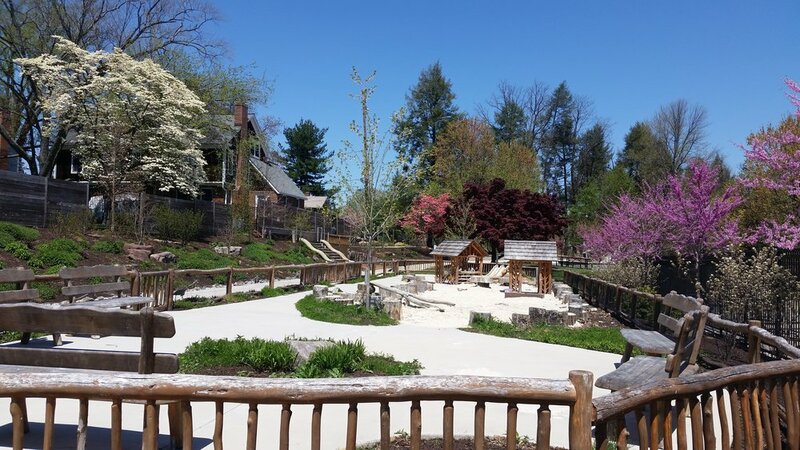 We will have an additional volunteer date on May 19 (9 am to 11 am) and in June to prepare the garden for the 150th celebration at Pleasant View. Let's see what we can accomplish together in 2018. If each of us helps just a little it will be amazing what we can accomplish. 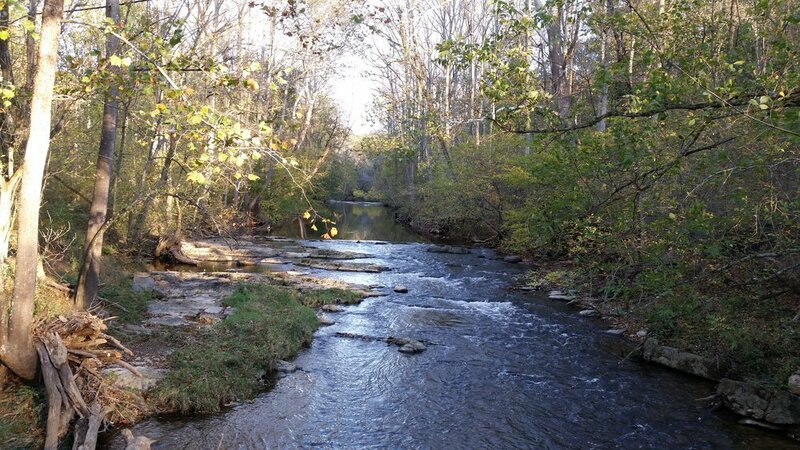 Join us to pick up trash along the Muddy Branch --- the watershed we are protecting with our Pleasant View project. Explore the Muddy Branch trail and help us keep it clean. We'll start at 1 p.m. from the parking lot at 15021 Durfief Mill Road (near Rt. 28 and Muddy Branch). 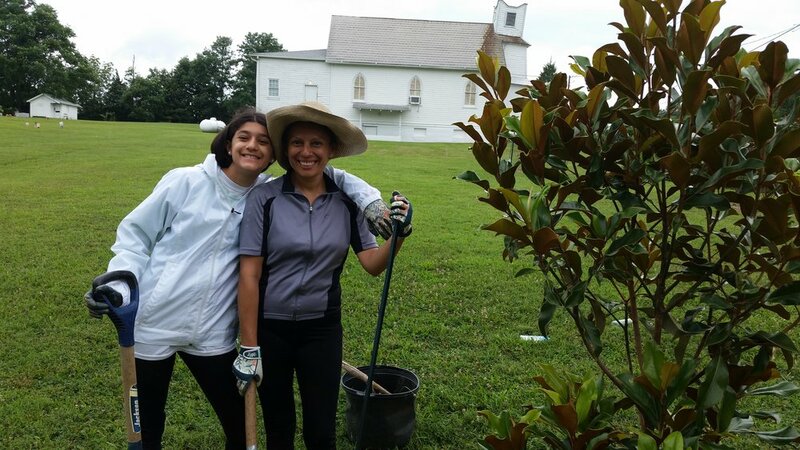 If you chose to serve somewhere other than Muddy Branch, please consider taking a photo and sharing it with us. Speaking of photos, Tompkins Hallman (left, age 90+) is sharing his experiences with Pleasant View volunteers in the historic colored school at one of our ESE planting events. Hearing him speak was a treasure -- WWII veteran, civil rights activist. Besides speaking to us he was out digging with us in the native plant garden. Help us weed, plant for fall, and replenish the mulch. Bring your own shovel. Come alone or bring family/friends. RSVP to merikays@verizon.net. We especially need all volunteers who can possibly come to join us on Saturday, Nov. 18. HELP WITH OUR NATIVE PLANT GARDEN IN THE MORNING OR EVENING OF 9/11. THIS IS A GREAT COMMUNITY BUILDING EVENT: HARD WORK THAT'S SATISFYING. As shown in the satellite photo, by 1996 Poplar Island had nearly disappeared. Restoration efforts are underway to save the island -- recreating its 1,000 acres of habitat. Join us on a free tour of this island. We'll be reserving spots at a state campsite for those interested in camping. This should be an educational and fun outing. There's a small museum on Tilghman Island featuring creatures from the Bay -- one of many optional excursions. We have a reservation for a group tent site at Tuckahoe State Park for Thursday, July 20 if you want to arrive early and enjoy more of this area. Adkins Arboretum is located within Tuckahoe State Park. There are hiking trails (walking actually - no elevation changes) and areas to canoe/kayak. A few fun ideas if you have time to spend on the Eastern Shore. If you're interested on sailing on the Bay, one option is the sailing yacht Lady Patty which sails from Tilghman Island. Other charter fishing and sail boats are available at various sites on the Eastern shore. On your drive to the Eastern Shore you might stop before crossing the Bay Bridge to visit the Sandy Point State Park. There's a wide beach here with playground equipment, boats to rent, and a great view of the Bay Bridge. It's fun to wade in the water (watch for stinging jellyfish) and watch the sailboats, barges and ocean vessels passing under the bridge. Or better yet rent a boat and get out on the Bay. With nearly 800 acres to explore there are also walking trails -- a great place to see birds. Just off route 404, (31 miles from Sandy Point) you could stop at the Adkins Arboretum and wander their trails. 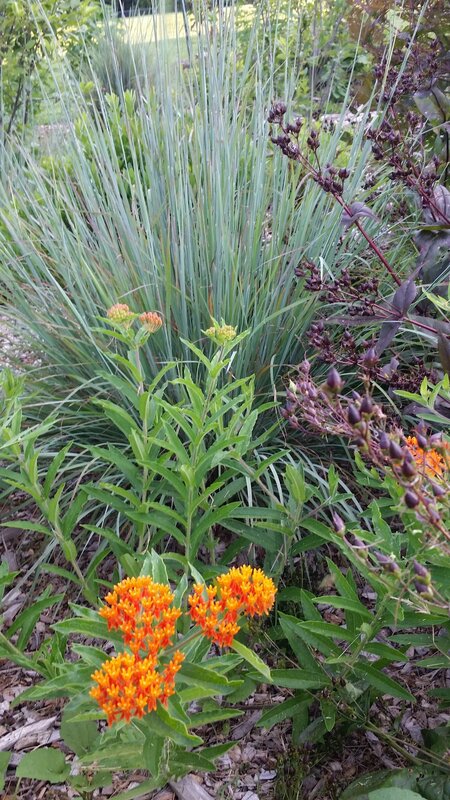 Enjoy the native plant landscaping and be inspired. They have a small native plant nursery on site if you want to buy plants for your home garden. There's a visitor's center and minimal fee to enter. The Arboretum is part of Tuckahoe State Park, the camp site suggested as a place to stay on Thursday night, for those who are interested. If you have time there's also the Pickering Creek Audubon Society (http://pickeringcreek.audubon.org) where there are trails, canoes/kayaks to rent on weekdays, a small garden and birding areas. "Native Plants for Your Garden"
Come learn about great native plants for the home garden. Merikay Smith, Master Gardener and Project Leader for the conservation landscaping at Pleasant View, will share photos and tips on including native plants in home gardens. Please invite neighbors and friends. 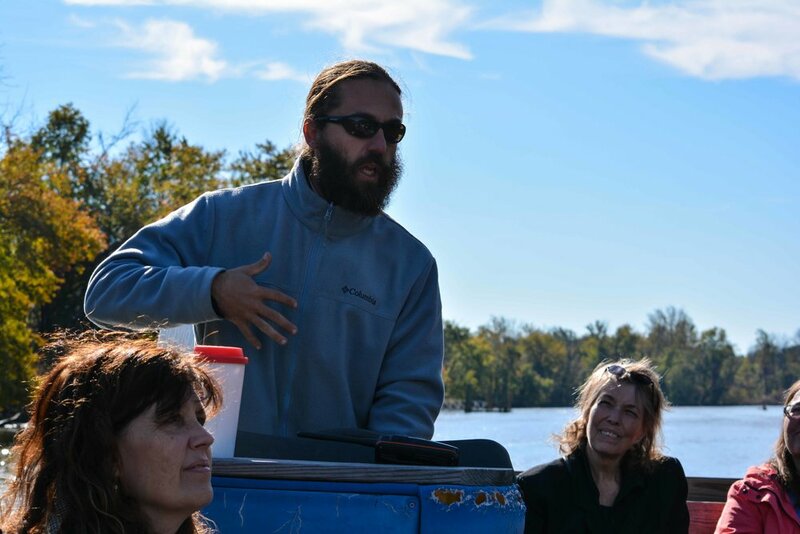 This talk is part of the educational component of the Chesapeake Bay Trust grant that Earth Stewardship East received for Pleasant View. While you're at PV, stop by and see how the garden is beginning to grow one month in the ground. RSVP on ESE's FB event post or to EarthStewardshipEast@gmail.com. Native yucca in the foreground, used to mark graves in historic African American cemeteries. Pleasant View schoolhouse in back, site of May talk. Join us for our final spring volunteer work day at Pleasant View. We'll finish installing two huge beds of native plants -- each 30 feet by 70 feet. Over time our plantings will provide habitat and better storm water management too. We'll also have time for volunteers to visit inside the historic colored school and talk with former students. Learn about how you can improve storm water management on your own property -- and tips on creating habitat with native plants. If you work with Scouts or other youth groups, consider including them in this project. We have several possible Eagle Scout projects that could be done on this property. Please email Merikay at merikays@verizon.net or signup on our Facebook page. We need to know who can help. Thanks! Large slope of turf/weeds that we will be replacing with native plants. What an exciting thing -- to be able to watch the conversion process over time as the plants take root and begin to grow. By next year they should look great for the 150th celebration of Pleasant View. The same slope after our Earth Day volunteer event. A few gaps that still need plants and the entire center needs newspaper/cardboard and mulch. We'll also add some trees and a planted bed under the entrance sign. We'll also talk about our Chesapeake Bay Trust grant to landscape the Pleasant View Historic Site and other upcoming plans. Most of our activities will be family friendly but this particular event is for adults only. Thanks to Chandler and Amy Griggs for hosting. Earth Stewardship East is co-hosting "Interfaith Light," the fifth annual interfaith environmental conference for our local area. Merikay Smith will be the keynote speaker joined by representatives of the Catholic, Jewish, Muslim, and Hindu faiths to share inspiration on care for the earth and care for the poor. We will look at Pope Francis' encyclical and what impacts this statement has had on local, regional and worldwide actions. We plan to have information on current issues being addressed in Annapolis by the current session of our state legislature. In the past this has been a great event for inspiration, learning and networking -- all to make a positive impact locally. Please invite your friends and neighbors, particularly if they are a "green team" leader in their faith. Join us for an interfaith vigil for prayer and meditation on care for Creation this Sunday, January 22, at 1 p.m. at the Brookside Garden Japanese tea room. People of all political backgrounds care about the earth -- let's join together in prayer. We will be less than one hour. You're welcome to wander the gardens and nearby woodland trails after. Please invite your friends. Children are welcome too since we're outside and will not be long. If you cannot be with us, consider setting aside time to pray and reflect on caring for the air, water, lands, and creatures of our earth. Click above (Merikay's photos) and below (Ken Mortensen's photos) to see full slideshowS. We will have two tours, one at 10 am and the other at 11 am, both leaving from the National Arboretum dock. Fall colors will be at their peak! Please share with friends who might like to join Earth Stewardship East. The more the better. Bring your own picnic and join us at the tables near the Anacostia dock area at noon. This Free event will be led by people who care about the Anacostia -- they'll share its history, wildlife, and environmental concerns. The boat carries 13 passengers. The Riverkeepers are willing to take one group at 10 am and a second group if we have that many interested. We have arranged for this tour to depart from the docks at the National Arboretum which is a wonderful place to visit. They ask that everyone on the river be ages 5 and up. We'll meet at Riley's Lock for a free event -- all welcome. Pick up trash stream-side or from a kayak. Kayaks and life-jackets provided. Afterwards BYOP (bring your own picnic). There's a covered area with tables. We can offer SSI (student service hours) to MCPS students. Twenty-five adults and four children attended the kick-off event for Earth Stewardship East at Merikay Smith's garden. We ate Chicago pizza and lots of delicious vegetable dishes. Despite rain we had a great time together -- kids left with tadpoles from the pond and it cleared enough for many to enjoy the garden. Kate Cummings shared our goals and elicited comments. Merikay spoke on Pope Francis' encyclical Laudato Si, "Care for the Earth: Care for the Poor." Our first meeting topic of Pope Francis' encyclical parallels the spring social for the LDS Earth Stewardship group held in Salt Lake City. Check our website's "Inspiration" section for posts on the Pope's encyclical.